Wedding2point0: Should you Elope or have a Big Wedding? Should you elope, or have a Big Wedding? In ancient times, people got 'married' by the bride moving to the husband's house (or, of course, in some cultures, the reverse). Gifts were exchanged, cattle and clothing and bread and food. The community understood that this was a family unit. Later, a civil or religious officiant would legalize/ solemnize/ bless the marriage, by conducting some sort of rite. In the middle ages, a traveling priest might come by the village and marry everyone in the spring, and baptize all the new babies, all at the same time. In Celtic areas, the couple might be handfasted for a year and a day, and then decide to become legally married at the end of that time. The traditions of the Jewish ketubah, or the Quaker marriage certificate and other ceremonies which involve the guests and parents signing a ceremonial document are related the traditions of how the community views the moral and legal obligations of the couple toward each other. In Jewish tradition, a couple usually signs the ketubah before the ceremony. The ketubah is written in Aramaic, and the bride and groom write their Hebrew names in the blanks in the marriage contract, then the rabbi signs the contract. Modern Ketubahs may have English decorations, and many are unique works of art. Some have spaces for the family and witnesses to sign at the reception. In Quaker tradition, the bride and groom sign a large, beautiful Marriage Certificate, which is then also signed by all the family and guests. This involves the community, and makes the marriage binding to each of its witnesses as well as to the couple. The certificate is usually framed and placed in the home. The LEGAL part of a marriage ceremony does not require the community to be there - or the parents, or the friends. A witness will do - but that witness is 'representing' the community, and civil society. When couples choose to be legally married in an 'elopement', they often have a wedding ceremony or a wedding blessing or a family party later. Sometimes this is for practical reasons, such as visas running out, or travel, or scattered family members, so a couple will have two ceremonies on different continents - one legal, one ceremonial. Sometimes this is done on the same day in a second marriage, such as the wedding of Prince Charles and Camilla, which was a civil ceremony followed by a service of blessing. A couple may have a private wedding for personal reasons, with a marriage announcement at a later date. And some couples pledge their troth to each other in a commitment ceremony, without a legal component, just an ethical one. 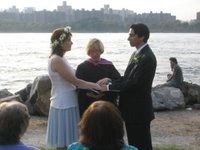 Some have handfasting (or betrothal) ceremonies which they consider binding. A vow renewal is an example of a wedding ceremony without a legal ceremony, as well. If you are having two ceremonies, a legal, private wedding and a future wedding blessing with a larger group of friends or family, you can save your rings for the second ceremony, perhaps, and have a Wedding Blessing and a Blessing of Rings for your second ceremony. Your family might also like to participate in the second Wedding Blessing, offering readings or blessings or a candle-lighting or other appropriate rituals. Some cultural traditions also have several separate ceremonies on several days. Some of these ceremonies are vestiges of earlier village rituals, where the bride or groom makes a journey to the house of the new relatives, and offers food or gifts (such as the Tea Ceremony, in some Asian cultures, and the large Wedding Banquet with the required special courses.) The modern wedding showers and rehearsal dinners are vestiges of these earlier rituals. Our grandparents were often married at home, or went off to the registry office to be married in a bigger city, and returned home for the wedding reception. Our modern elaborate weddings are not as old a tradition as they sometimes seem. This is YOUR decision. You can combine the legal and the ceremonial events, or hold them separately,and at separate times, or hold only one part - the legal wedding or the wedding ceremony. Your officiant will always be happy to discuss these variations with you, and help you through the planning for each. See elopenewyork.com for more discussions of eloping. This article by Mary Beaty licensed under a Creative Commons Attribution-No Derivative Works 3.0 Unported License.